With its giant Nelson Mandela bust greeting visitors outside its east doors since 1985, the Royal Festival Hall is a fitting location for an operatic treatment of Mandela’s life. 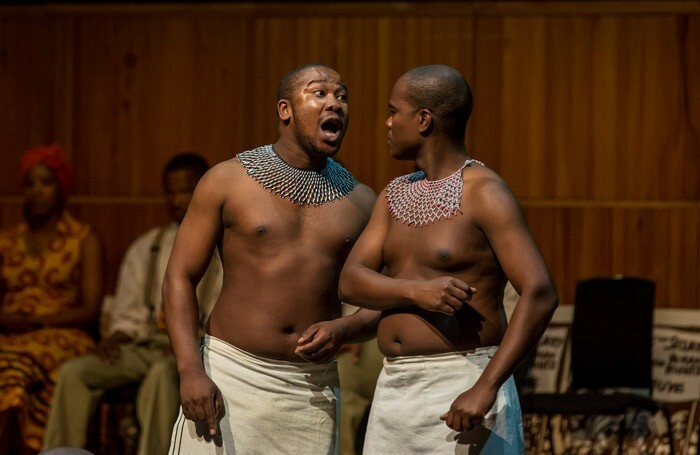 Cape Town Opera’s Mandela Trilogy presents episodes in his iconic story from freedom-fighter to president. It first came to the UK in 2012, co-produced by Wales Millennium Centre, and this latest version, which continues on to Southampton, Dublin, Birmingham and Salford, incorporates important musical changes. The first act, chronicling tribal initiation rites and the young Mandela’s decision to leave his home town, is newly scored by Peter Louis van Dijk, whose accessible contemporary style – shades of Janacek and Philip Glass – also drives the powerful final act of imprisonment and eventual freedom. The central section, rebellious 1950s, remains Mike Campbell’s jazz musical. Surprisingly, this has less energy, the middle-of-the-road score inhibited compared to van Dijk’s more dramatic approach. Consistency is ensured with use of Xhosa folk music throughout, and by Michael Williams’s libretto, duly serious but with plenty of humour. The large cast, lead by Mandla Mndebele’s superbly dignified and human Mandela in maturity (there are two younger personifications), is terrific. And, although RFH audiences have to make do without sets (it is fully staged everywhere else), Michael Mitchell’s colourful costumes and Sibonakaliso Ndaba’s lively choreography provide plenty of theatricality. Incongruously, there is just one black musician in the 40-strong orchestra (the combined forces of Cape Town Philharmonic and London-based 12 Ensemble), in marked contrast to the almost entirely black cast; both composers are white South Africans. The classical music world still has a lot of work to do towards racial parity.